A plane slipped off the runway Wednesday morning at O'Hare International Airport while taxiing to a terminal, a Chicago Department of Aviation spokesman confirmed. 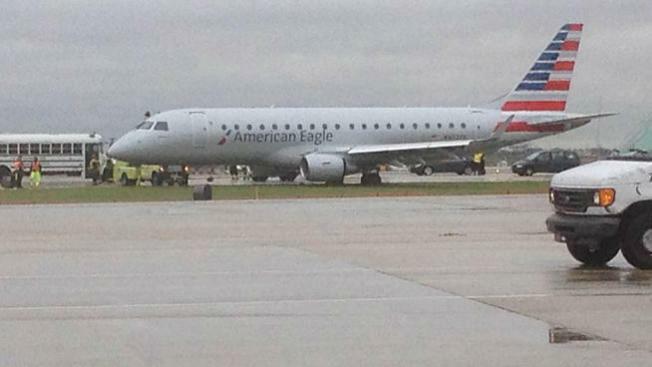 American Eagle flight 4332, arriving at O'Hare from New Orleans, slid partially off the tarmac after landing in the rain, spokesman Greg Cunningham said. The nose gear was partially on the grass, Cunningham said, and the rest of plane’s body was on shoulder pavement on Runway 27 left. The plane was pulled out of the grass and mud around 10:30 a.m. and towed to the hangar. Airline spokeswoman Mary Frances Fagan said the plane landed "normally and safely" at the Chicago airport. "While taxiing to the terminal at O'Hare, the aircraft exited the taxiway and the nose gear of the plane ended up in the grass." Passengers deplaned on the runway and were bussed to the terminal. No injuries were reported, Cunningham said. Panasonic Employee Bill Kinsley, who witnessed the incident, was working on another plane when the slip occurred. The pilot "got too close to the grass and his main wheel is about halfway in the mud," Kinsley said. The runway was closed Wednesday morning, but Cunningham said the closure likely won't delay other flights. The NTSB was notified and the plane will stay in place for an indefinite amount of time, Cunningham said.